NewWest (the voice of the Rocky Mountains) did a good write up on the "outdoor biz" from the latest study from the Outdoor Industry Association (OIA). There is some funny industry terminology in here, such as "frontcountry" (areas close to home, vs. the "backcountry") and "Melinials" (the generation after the Baby Boomers who crave extreme sports). In summary - apparel is up, tent sales are down, earth tones are in/bright colors are out, outdoor sports are blending together more and more, and 2/3 of all of us enjoy outdoor activities of some kind. 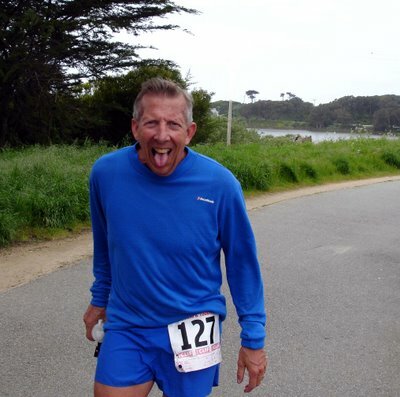 Did you know we have celebrity in our ultrarunning ranks? Apparently Pat Monahan, the lead singer from the Grammy-award winning Train, hits the trail regularly while on tour (you can read about it here). Who knew? Lastly, I found another oh-my-God-that's-a-good-idea product out there called the Firefly Lantern Bottle. It's a water bottle with small lights in the cap that light up the water like a lantern (a well-known trick for lighting up the tent). How cool would it be to see these light up the trail on a 100-mile run? 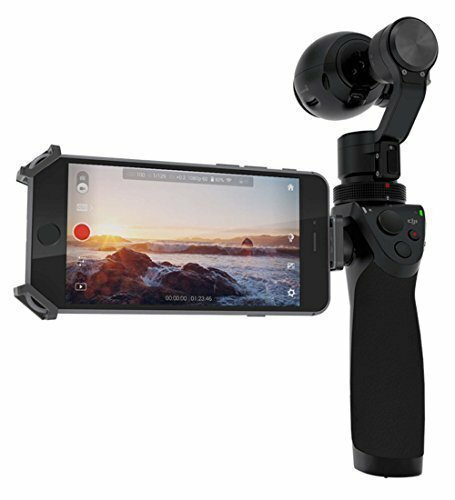 It is coming out this Spring, so if you're looking for a gift idea for the outdoor enthusiast who has everything (and according to the OIA, there are a lot of you), here's a new one. Talk about a dream job! Run, write, test shoes - this is as good as it gets. Feel free to contact Michael Benge if interested. TRAIL RUNNER IS NOW HIRING. For the first time in several years, we have a coveted editorial position open. While we will greatly miss our current Senior Editor, Garett Graubins, as he pursues new adventures in the Bay Area, we are looking to fill his large trail running shoes. If you (or any of your running partners) are a professionally trained editor and writer and looking for a special opportunity, please check out the job description below. Thank you in advance for your help and happy trails. 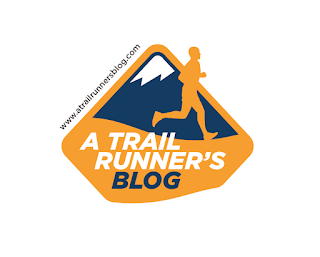 Full-time position for Associate Editor at Trail Runner magazine. Write, assign, edit stories for bimonthly magazine; copy edit all content; contribute story ideas; solicit and evaluate outdoor gear and equipment, with an emphasis on twice-annual shoe review; collaborate on production of magazine; write and edit monthly e-newsletter. Casual office environment. Position based in beautiful Carbondale, Colorado, in the central Rockies. 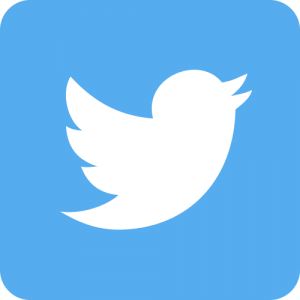 - Journalistic experience and an eye for objectivity. A writing style that educates and entertains while displaying a sensitivity toward the marketing needs of a growing publication. - Intimate knowledge of the people and events that make the sport of trail-running tick. 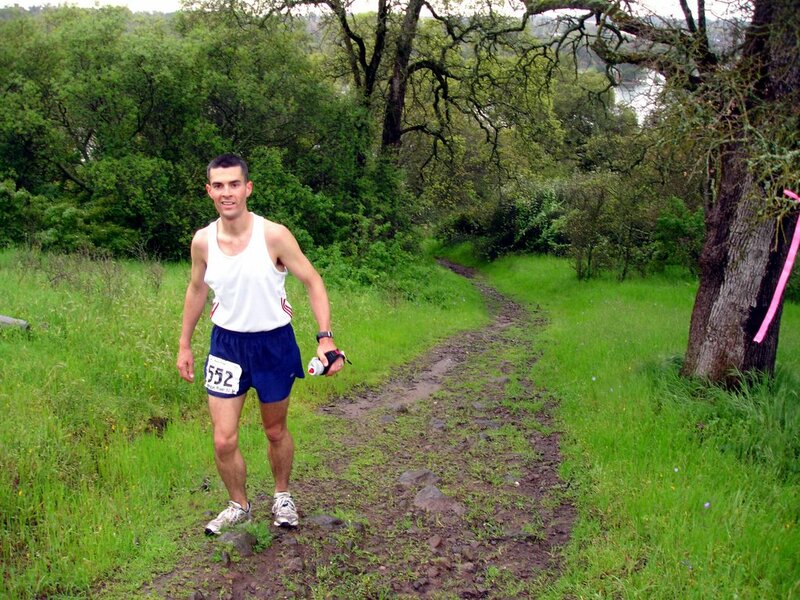 Who is Scott Jurek? Why does the Dipsea sell out year after year? Where's the Long Trail? You should know the answers to these questions. - Familiarity with trail-running gear and manufacturers, including shoes, hydration systems, apparel (high-tech fibers), shells, sunglasses, etc. You don't need to be a gear geek, but it would help to know the following terms: bite valve, anti-microbial, medial posting, upper, polarized, wicking, waterproof-versus-water resistant. - An ability to work well in a collaborative setting. Communication skills are a must. No introverted prima donnas, please. - Familiarity with other publications in the outdoor industry, including those against whom Trail Runner competes directly. A personal zeal for the sport. If you work here, we'd like for you to walk the walk, run the run, and talk the talk. Some our best brainstorming takes place on a seven-mile jaunt up the nearby mountains. Please send resume and writing samples to: Michael Benge, Editor, Trail Runner magazine, mbenge@bigstonepub.com or by regular mail to: Big Stone Publishing, 1101 Village Road, Suite UL-4D, Carbondale, CO, 81623. Last weekend, I returned to Boston to join 22,000 runners for the 110th running of the Boston Marathon. 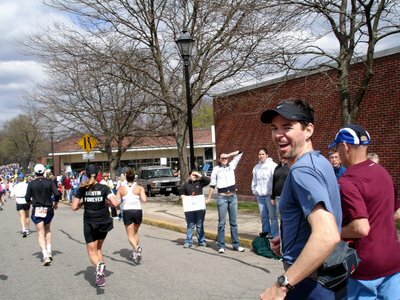 This was my 2nd Boston (I qualified for this Boston at the 2005 Boston Marathon), but I was planning on taking a very different approach to the race this time. No land speed records, no split tracking, no PR’s – just running with friends at a more casual pace and enjoying every minute of this 26.2-mile long party. My goals? Give 262 high fives, take some pics along the way, drink a beer at Heartbreak Hill with the Hash House Harriers, and get a kiss from one of those gorgeous Wellesley girls with the “kiss me, I’m smart” signs. Now THAT’S my kind of marathon! 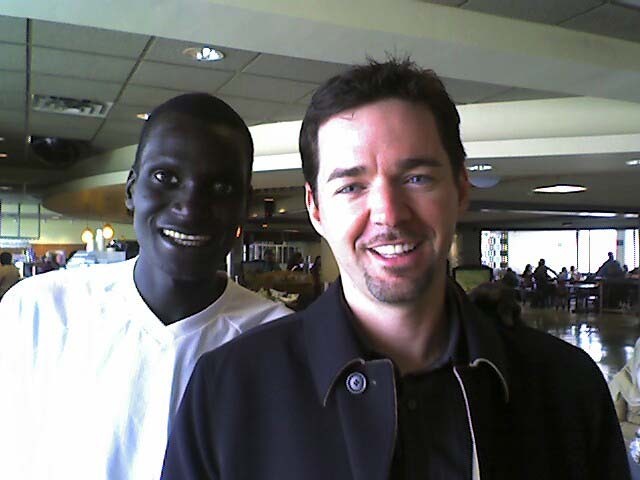 Little did I know I would also get a chance to meet the winner of the Boston marathon too. I flew in on the red eye Saturday night, and after a quick breakfast with the Boston dock workers at a local greasy spoon, I hit the Runners Expo. The excitement was palpable, as runners and their supporting friends and family gobbled up merchandise as fast as it could be stocked. Like last year, I met dozens of people who considered this race the pinnacle of their year (if not their athletic career) and were purchasing anything that could publicly proclaim “I did Boston”. As a trail runner, I felt like a welcomed outsider in a cult of ultra-thin, shaved-legged road rabbits. Popular booths included the Clif Blocks sample table (snacks! 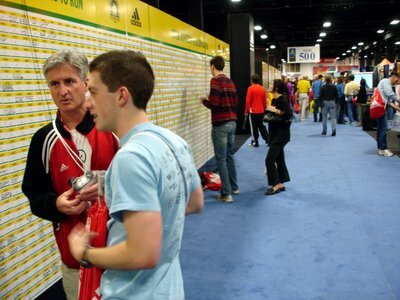 ), the Adidas booth with wall-to-wall Boston merchandise, and the MyMarathonDVD booth that creates a personalized DVD from six cameras along the course. At 10am, Dean Karnazes made a brief presentation about his book (you can hear a similar NPR interview here), and his upcoming “E50” challenge. E50 is Dean’s attempt to do 50 marathons in 50 days in 50 states this Fall, all to raise money and awareness for Karnos Kids, his non-profit. There were lots of questions from the audience about his training and motivation, and it was clear that nearly everyone in the room had read his book. Yet I was surprised that most of the audience referred to ultrarunners as “a different (and crazier) breed”. It’s really only a few more miles, right? 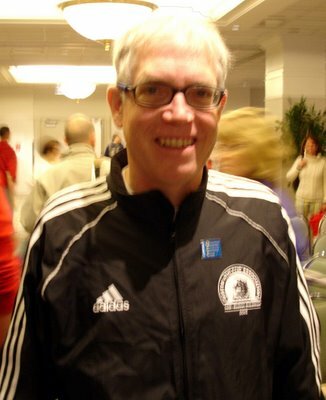 Dean was gracious and friendly, and talked about the pacing and recovery challenges of doing consecutive daily marathons (for example, anything faster than a 3:30 marathon yearns for recovery on the next day, something he had learned from practicing races over four days), and how travel time will be a bigger factor this time around. For the days that Dean can’t run an “official” marathon, he will be running an official course with the help of Race Directors to ensure it’s all legit. I mentioned to the guy next to me that this sort of thing must take serious dedication. Little did I know I was talking to Neil Weygant, who was about to attempt his 40th consecutive Boston Marathon. Wow! As I left the Expo, I read much the “22,000 reasons to run Boston” board, an oddly motivating wall of stickers where you can find your number and write in your main motivation for being here. For some, it was “because I can”, for others it was to honor a loved one, but for most, it was a personally-declared statement of triumph, as if you could escape death itself if you ran fast enough. For me, it was a dedication Rocky the Pug, who taught me that a love of running comes straight from the heart. This Boston was going to be all about fun, and Rocky wouldn’t want it any other way. The night before the race, I caught up with my running pals, Kristin Armstrong and Paige Alam, and their morale-support crews (Kik's friend Eric and Paige's husband Jamil, as well as their friends the Boyles). We dined at Teatro, discussed life and love, and the various paths that brought us all to Boston this day. Eric and Jamil were looking forward to seeing the Red Sox play Seattle, which would get out just in time to see us at the marathon finish. I’ve told you guys about Kristin before, and you may have heard about her good friend Paige from the articles in Runners World. Paige is a perfect running pal – motivated, funny, and a kindred soul that is always providing moral support. As they recalled their adventures over the last year, it was always “Kik and Paige, BFF (Best Friends Forever)”. One of the best parts about these two is they know how to challenge each other in little ways. 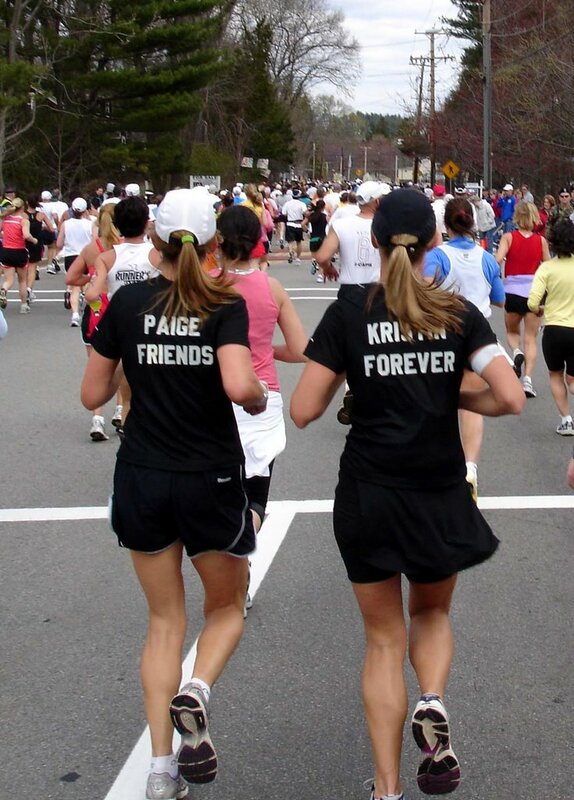 For this race, Kristin had convinced the split-obsessed Paige to run without her watch. This is a tough consideration for a talented and competitive runner like Paige, and you could see her physically squirming with the idea. She took some comfort in knowing I would have a watch “just in case”. The next morning, I caught up with Kristin and Paige about 45 minutes before race start and we made our way to the starter corral. My blue number (#3103) stood out among the sea of red numbers in the 12,000-13,000 corral, but I was welcomed with open arms. The runners here were much more diverse than the 3-hour corral – people of all shapes and sizes, matching Elvises, you name it. 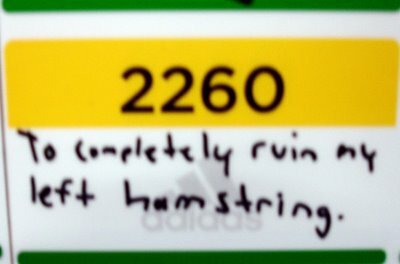 As we started running, I could see a lot of these people weren’t “natural runners”. Their gaits and strides were as varied as one could imagine, but they all found a rhythm they knew well from putting in the training miles. I instantly had tremendous respect for these runners. Who better to represent the Boston Marathon than those who overcame the most to get here? Kristin and Paige had dressed well for the occasion, as they always do. Paige had a shirt that said “Go Paige” on the front, while Kristin had “Go Kristin”. Within a few hundred yards, they were already getting shouts of support. 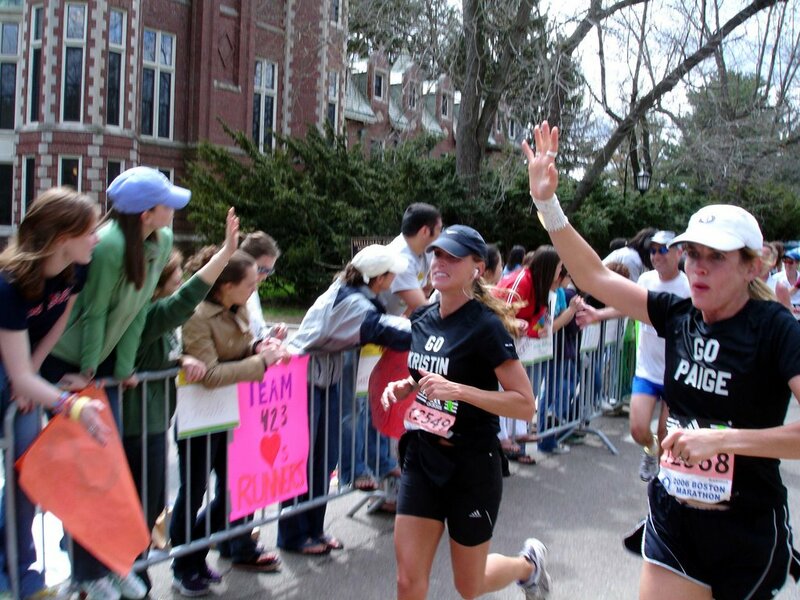 After a few miles and a few hundred thank yous, Paige began to understand the magic of Boston Marathon fans – she was going to be hearing “Go Paige” for the next four hours! She cracked a smile that never left her face the whole race. The ladies set the pace and I glanced at my watch at each mile, amazed at the consistency of our time as we weaved through the hills. 8:13, 8:17, 8:15, 8:18…so far, a pretty quick race. Kristin was leading the pace on the flats, while Paige-the-mountain-goat pulled us up the hills. At each mile marker, Paige would read off a prayer or focus word, such as “hearing”, “truth”, “calling”…a wonderfully addictive way to pass the miles. I found my thoughts gravitating towards my excitement about impending fatherhood, and how much I appreciate sharing a running experience with friends. 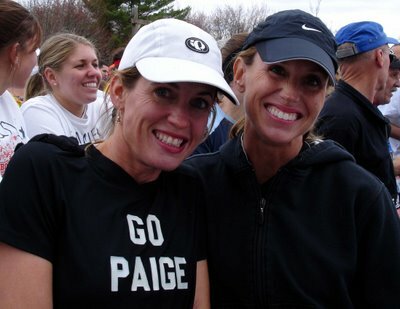 Paige and Kristin, both great moms, were the perfect friends to share the day. We ran through Ashland, where the bikers and Harley-Davidson crowd cranked up the rock n’ roll, and enjoyed the perfect running weather (53 degrees, partly cloudy). Paige had signed up for the MyMarathonDVD and was eagle-eyeing cameras to make sure we hit each one. We contemplated mooning, but thought it might not be good for the family archives. In the longer miles, we chatted with other runners who had come from all over the world – Norway, Italy, Australia, Japan, South Africa, Chile, China, and more. Although it was Patriot’s Day, the pride on these streets was more than American. Mile 10 came up fast, and it was the first mile where Paige and Kristin naturally slowed down to 8:50/mile. But the constant support from the crowds rallied them back on pace by Mile 12 and straight through to Wellesley College, aka, the “Scream Tunnel”. If you don’t know what this is, imagine the front row of a Beatles concert lined up for nearly ½ mile, all girls screaming with excitement. It is truly amazing! I saw a few “kiss me” signs, but hesitated after wondering how my wife’s best friend (Kristin) might explain the scene to my pregnant wife. I couldn’t risk it - the recipe for a life sentence in the dog house was too great if that kiss lasted a little TOO long. But would these girls really kiss a stranger? Just as I thought that, a young man with “Norway” on his shirt stepped right up and was grabbed by three gorgeous froshies, nearly drowning in kisses. 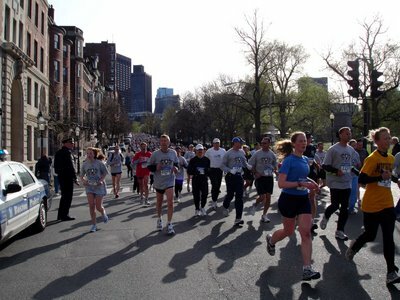 How about that…a whole new incentive to qualify for Boston! I snapped some pics as we headed into the hilly section of the course. Our pace had slowed to about 8:25/mile around mile 18, which one would expect in the hills. The rolling up and downs gave our legs some variability, and we refueled to prepare for Heartbreak Hill. I accidentally passed the Hash House Harriers aid station, so I turned around and ran back for a beer. It looked like a normal aid station, except each plastic cup had 2-3 oz of beer. When I grabbed one and yelled “bottoms up!”, everyone cheered, grabbed a cup of their own, and drank with me. As I took off to catch my pals, it dawned on me how much those guys were going to drink today…and it was only going to get more intense as the slower folks indulged. Again, amazing fan dedication! The beer really hit the spot. Easily digested carbs, tasted good, and smoothed out my running a bit. Maybe these Harriers are onto something! I caught up with Kristin and Paige and we all knocked down Heartbreak Hill with ease. Just a 10k to go! Paige was hamming it up big time in the last few miles, and the crowd loved it. She must have said “thank you” a thousand times. As Kristin and I laughed, it helped us keep moving forward with a smile on our faces. I glanced at my watch and realized we were just a couple of minutes off a 3:40 pace, which would allow Kristin and Paige to qualify for Boston again. Should I say something? Or wasn’t the point to not worry about it? I decided not to mention it and keep the spirit of our run intact. As we rounded the last corner, Eric and Jamil were there to lay on some last minute kisses on their sweeties (even better than a shot of caffeine! ), and we joined hands to cruise in to a 3:44:46 finish, good for about 9,970th place. Hugs abounded at the finish (including strangers), and everyone seemed pleased with the day. Rena Schumann, one of three California ultrarunners I saw out there, was resting after a stellar 3:11 finish, as was ultra-phenom Mark Lantz who clocked a 2:52. We knew we would all see each other at the Miwok 100k in a few weeks. A shower and nap later, we all dined at Anthony’s at Pier 4, a superb steak and lobster restaurant with one of the best views in Boston. We replayed the marathon mile-by-mile, and Eric and Jamil shared the Sox game play-by-play (a come from behind win for Boston after a 9th inning homer). All in all, an epic day to share with friends. I headed back to my hotel room, unable to sleep because I didn’t want the day to end. So I just started thinking about the next race, which slowly pulled me into dreamland. The next morning, I got an unexpected treat at the airport. I sat down in a Starbuck’s and asked the guy next to me if I could read one of the five papers he had. When he smiled, I realized he was the same guy on the cover of the newspaper – Robert Cheruiyot from Kenya, who had won Boston in a record-breaking 2:07:14! Robert and his Nike rep were very nice, and let me take a photo with my camera phone (sorry it’s not the best photo, but it’s him!). Robert was friendly to everyone, asking all the other runners how their race went. He was saying how the weather conditions were perfect and that he felt like he had a 2:06 in him, but listened to his coach, Paul Tergat, and just focused on the win (his second Boston win after winning in 2003). The rest of us listened in awe, knowing we couldn’t keep his pace for a mile even if our life depended on it. When I come back to Boston next time, it’s going to be a toss up on running it fast, or running it fun. It still amazes me how a race can be so different if you just approach it with some novelty. If doesn’t take much to change the race atmosphere. Go slower. Drink the beer. Kiss the girls. I guarantee you, it will be a race to remember! Dr. James Watson, Nobel laureate and co-discoverer of the double helix, recently wrote an article for Seed Magazine that talked about the latest studies regarding memory loss. One study he cited showed may show that distance running can reduce memory loss. * Storage of new information in your brain is based on a process called "neurogenesis", which produces new neurons in your brain to store information. * You've heard that "you can't teach an old dog new tricks". It turns out that age does limit your ability to learn new things, because post-adolescence, the brain stops growing and neurogenesis only happens in the hippocampus (where memories are formed). A key part of retaining the ability to learn is to maximize the rate with which we can generate new neurons (nerve cells) as we get older. 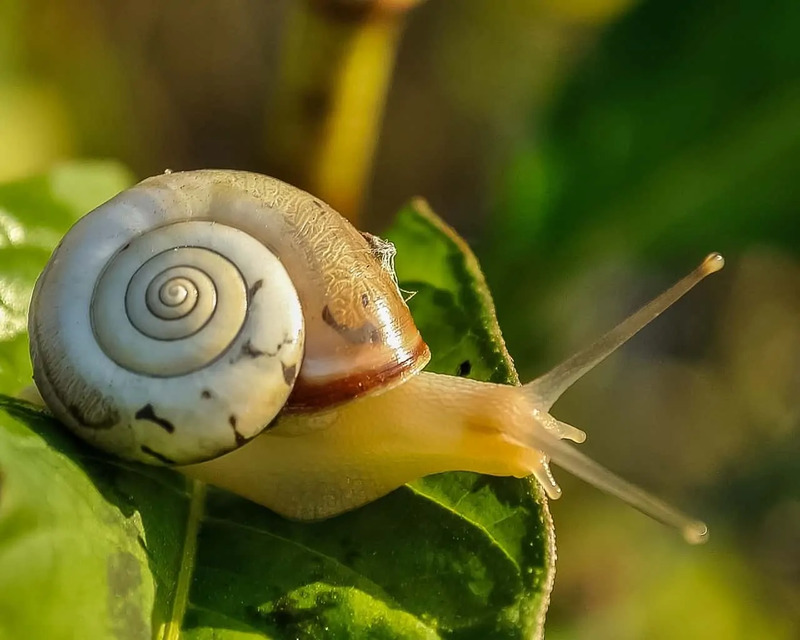 * An experiment with mice has shown that when mice use treadmills to run long distances each day, they make new nerve cells at double the rate of their sedentary peers. This had yet to be tested on humans, but it is encouraging. Takeaway - can't remember what to do today? Then GO RUN! 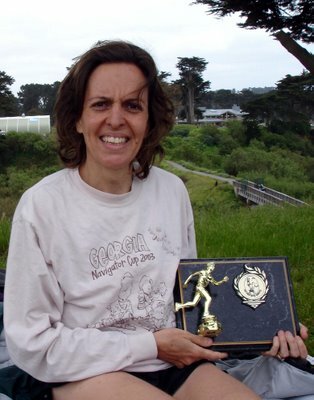 Below is a press release with the latest update on the 2006 Trail Runner Magazine Trophy Series. It looks like the 100k's continue to define the leader board for Ultra Division, and I'm sure the upcoming McNaughton 100-miler will change it up too. In the Marathon-and-Under Series, short-course speedster Hugh Davis from Indiana shows he isn't afraid to travel to get some points on the board. Our best wishes to 2005 Marathon-and-Under champion Dale Reicheneder for a fast and speed recovery from his heel surgery. If the first release of Trail Runner magazine's 2006 Trophy Series standings is any indication, there will likely be many racers vying for the 2006 title, right down to the wire. Sponsored by LaSportiva and GoLite, the Trail Runner Trophy Series is the world’s largest off-road running series. 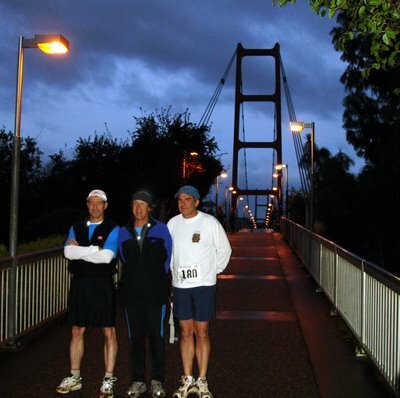 In this its third year, the 2006 Series will encompass over 110 races and more than 20,000 runners from March 1 to September 30. Trophy Series race participants earn points for completing events as well as bonus points for top age-group or overall placing. Runners clash in two divisions: (1) Marathon and Shorter, and (2) Ultramarathon (including any races longer than 26.2 miles—the marathon distance). For information on the 2006 Series—including a complete race schedule, rules, news and details on points scoring—visit www.trailrunnermag.com. PLEASE NOTE: All point totals include only Trophy Series races that have submitted their results in the correct format. The March 25 March Mudness 100K had a deep impact on the Ultra standings, as the longest-distance 2006 Trophy Series race to date. 35-year-old Phan Van of Maple Valley, Washington, won the women’s division of the race, held in Portland, Oregon’s legendary Forest Park. As a result, she leads the Series. Shawn Lawson, 29, of Renton, Washington, stands in second place overall, after she placed second in the March Mudness 100K and garnered finisher points in the March 18 Chuckanut 50K in Bellingham, Washington. Behind Van and Lawson, with 202.64 points, sit the men’s and women’s winners of the Rockin’ K 50.6-Mile Trail Run, held April 1 in Kanopolis State Park, Kansas. Paul Schoenlaub or Saint Joseph, Missouri, and Tammy Stone of Florence, Colorado, are in great early-Series position. A bevy of runners—winners of the season’s first crop of 50-mile races—have 200 points each, including perennial front runners Sean Andrish of Leesburg, Virginia, and PF Potvin of Miami Beach, Florida. Hoosier corrals early Marathon & Shorter Division Lead Tell City, Indiana, is not known as a trail-running hot bed. Such distinctions are normally reserved for other towns. But Tell City-native Hugh Davis seems intent to change that. The 42-year-old Davis has set an impressive early pace to grab an impressive lead. He took second in his 40-49 age group at the John Holmes 15-Mile Trail Run, held April 1 in Brooksville, Florida, first in the Land Between the Lakes 24K Trail Run on March 11 in Grand Rivers, Kentucky, and placed second in the Series’ opening weekend, when he raced the Seneca Creek Greenway Trail Marathon in Damascus, Maryland. A large cluster of racers—age-group winners of the season’s first trail marathons—are lingering behind Davis. They include: current women’s leaders Monika Brachmann, 40, of Comus, Maryland; Lucia Davidson, 60, of Arlington, Virginia; Jen Jacobs, 29, of Washington, DC; and Suzie Spangler, 35, of Annapolis, Maryland. 2006 Trophy Series champion Dale Reicheneder of Malibu, California, started the season strong, but has been sidelined by surgery to repair a “Haglund’s Deformity” on his right heel. The condition had become too painful for Reicheneder to run. 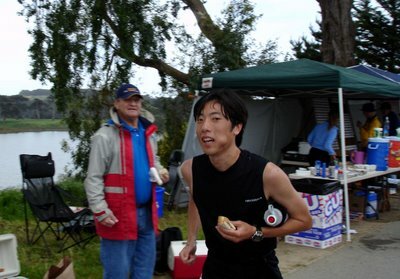 Despite being sidelined, he still plans to give the 2006 Series a try, and anticipates running later in the summer. including: Peterson Ridge Rumble (April 9, Sisters, OR); Capitol Peak 50 Miler (April 15, Olympia, WA); Mt. 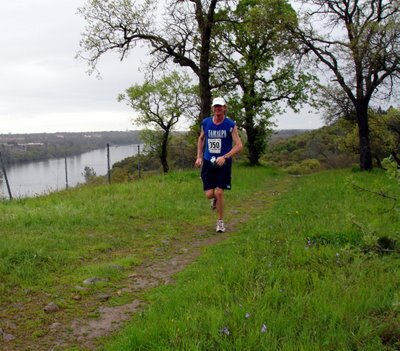 Si Ultra Runs (April 23, Snoqualmie, WA); and the Spokane River Run (April 23, Spokane, WA). (April 29, Carson City, NV) and Zane Grey 50-Miler (April 29, Payson, AZ) for their Trophy Series fix. Series points at the April 22 and 23 Spring Desert Ultra Trail Running Festival in toasty Fruita, CO. Go to www.geminiadventures.com for info. opportunities: McNaughton Park Trail Runs—which includes the Series’ first 100-mile race (April 15, Pekin, IL); Double Chubb 25K and 50K (April 22, St. Louis, MO); and the Trail Marathon and Half Marathon (April 30, Pinckney, MI). Flatwoods Four Trail Race (April 9. Thonotosassa, FL) and Owl’s Roost rumble (April 29, Greensboro, NC). 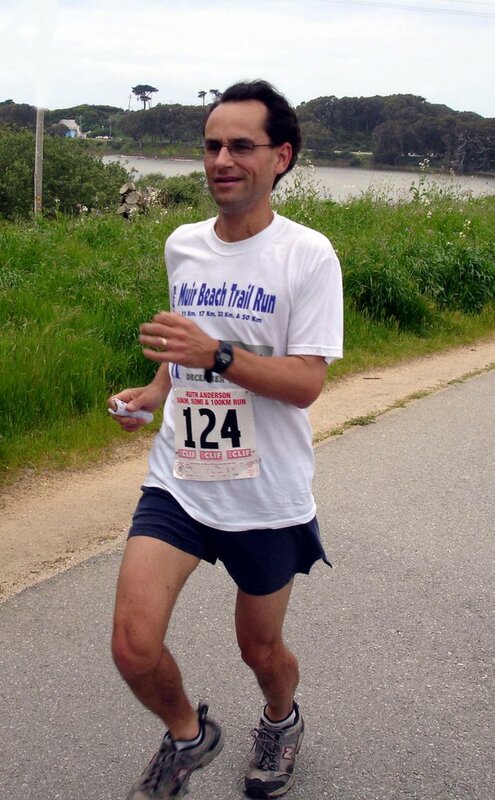 Novelist Michael Collins from Bellingham, WA, beat 53 competitors to win this years North Pole Marathon in 4:28. Nice work, Michael! Looking forward to the Sunsweet 2-Day Trail Fest (July 22-23, Oakridge, OR)! I have a lot of great races on the schedule this year, but I have found myself getting the most excited about the Sunsweet 2-Day Trail Festival in Oakridge, OR on July 22-23. Four races in two days in some of the most scenic areas of Oregon - what's not to like?!? In case y'all hadn't heard about it, I thought I would give you some of the highlights. You can pick up an entry here. Race 1, the "Oregon Adventure Hill Climb" - Going UP! A 5 mile mountain run, ending with a 3-mile, 2200 vertical foot climb that would make Bernie Boettcher proud. Race 2, the "Flying Turtle Downhill" - After a brief rest, groups of 4 runners/mountain goast sail down a 5-mile course in 1-minute intervals. If you have the need for speed, this is your race! Race 3, the "Salmon Creek Stomp" - The afternoon race is a 10-mile run along Salmon Creek, one of the many gorgeous river runs that have made Oregon races like Where's Waldo 100k and the McKenzie River Run 50k instant classics (yes, I know "instant classic" is an oxymoron, but honestly, you will know what I mean as soon as you see the place). The kids can join in on the 1-mile Fun Run while you are out, play some minature golf, or meet you at the big dinner bash at the Trailhead Cafe. Race 4 (on day 2), the "Sunsweet West Fir 50k". No race festival organized by the Abbs would be complete without a 5800 vertical foot ultra, and that's what awaits you on Sunday morning. If the distance is too much, you can run the 50k as a relay with up to 6 people. The course provides plenty of eye candy, including the Westfir Covered Bridge, the Middle Fork of the Willamette River, and scenic views from atop the mountain ridges. As a former Oregonian (with a father who obsessively skied at nearby Willamette Pass), I got to visit Oakridge quite a bit over the years. The trails are lush, the trees are huge, and the water is insanely clear. The town's low key (and low cost) nature feel more fitting to me for a trail festival than the glitz-and-glamour Teva Mountain Games in Vail, CO. Oakridge people are laid back, have a deep appreciation for the outdoors, and welcome all visitors. There's going to be a Fat Tire mountain bike festival in Oakridge around the same time, so the whole town is going to be celebrating the joys of outdoor recreation. I think it's going to be spectacular weekend, particularly for these first few years before "word gets out". You can get a lot of "bang" for your trail running dollar at this event, and I'm looking forward to sampling the many trail formats. My thanks to Beverly and Alan Abbs, the Sunsweet Team, and all the volunteers for their hard work in making this vision into reality. I look forward to a great time. 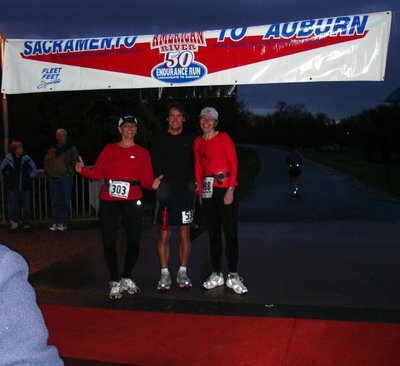 This Saturday I joined 477 ultramarathoners for the 27th running of the American River 50-miler (AR50) from Sacramento to Auburn, CA. 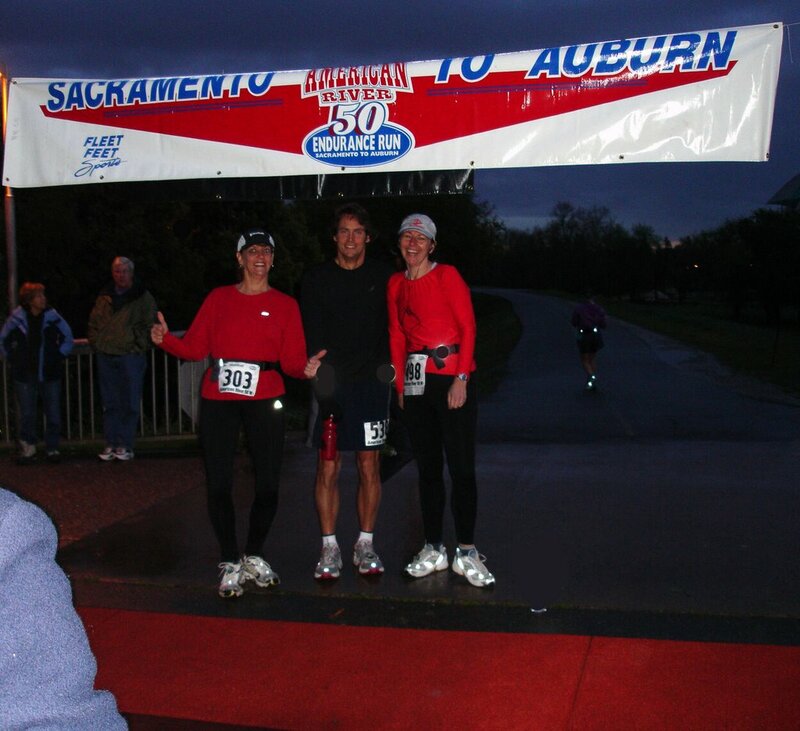 Known as a popular race with a healthy mix of dirt and pavement, the AR50 has had over 200 runners since it's inception (just ask Gloria Takagishi, who has run all 27!). Despite record-breaking rain in the the area, we got a reprieve from the rain just long enough to enjoy a beautiful day on the American River Canyon. My day started early - 3am - since I wanted to hit the local Denny's for a Grand Slam breakfast before taking the 4:15am bus ride to the start (that's about as close to an ultra grand slam as I get). I ran into Elizabeth Carrion and Paul Morris there, who had come out from New York for their second running of the AR50. Paul was building up to his first Western States, after his lottery number came through. Lucky for him, Elizabeth was a veteran 100-miler, so he had a pacing crew ready to roll. Once we scarfed our food, we made it down to the Auburn Dam Overlook to catch the early bus to the start. In the bus, I taped my feet and packed my drop bag. The AR50 is about half road and half trail (mostly in that order), which gave me my first chance to try using a drop bag. I put in some trail shoes, a change of socks, a foot care kit, and a few snacks for the road, ready for the Beals Point (27.1 mile) drop. 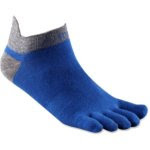 For the first half it would be road shoes with gaiters. The bus arrived at Guy West Bridge about 40 minutes before the start, and everyone mixed and mingled. 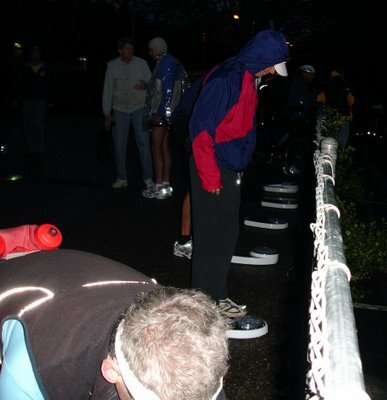 It was comfortably cold (low 40's), cloudy, with a light mist of rain - ideal conditions for a long run. There were racers everywhere for this sold out running, including many eager first-timers. A few runners were joking at the weigh-in station that their weight varied by 4 lbs depending on which scale they got on (yikes!). I recognized a lot of people from Way Too Cool. I ran into Luis Escobar (ultra guru and RD for the Santa Barbara 9 Trails), Jeff Zahn, and a few other SoCal faces as we made our way to the start. Before we knew it, we were off! 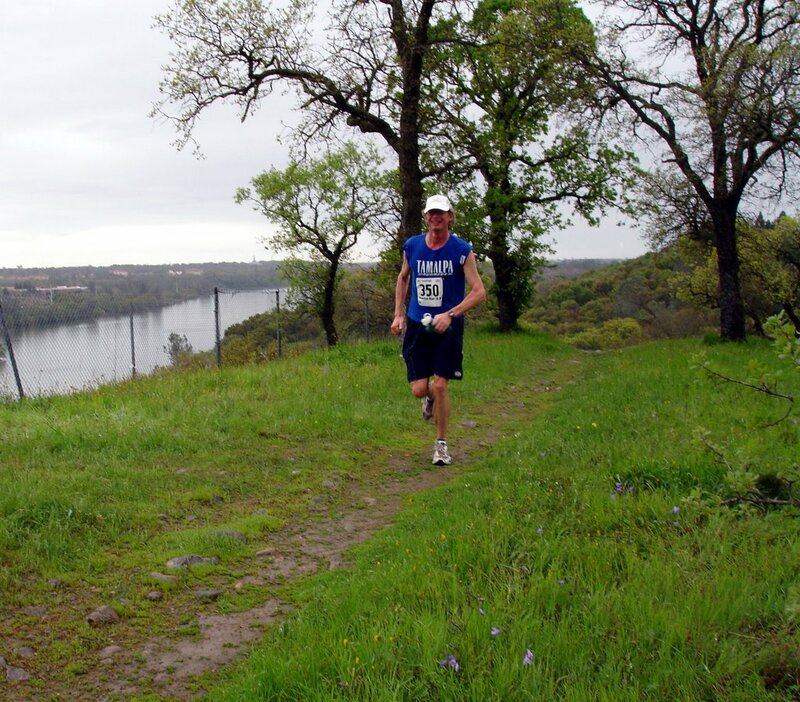 The race began with a quick two mile loop on a wide road, before circling back east to head up the American River. At the turn, we saw the front-runners setting a blinding pace, including Uli Steidl, Chris Zaiman, Eric Skaden, Simon Mtuy (who recently set the up-and-down speed record for Mt. Killimanjaro), 2005 50k champion Julie Udchachon, Julie Fingar, and more. I had started a bit too far back in the pack, so I began working my way up. I ran by Michael Fink and "Baby Lamb", the stuffed mascot that has ridden in his fanny pack on year of runs and hikes. Gordy Ainsleigh was right by him, finding a good pace and chatting up some first-timers. About 30 minutes in, I caught up to Rena Schulmann (a sure sign that I was going too fast) who let me know she was training for Western States #9. Rena had a great pace going, and knowing her, she was just warming up. The 22 miles of pavement at the start allowed us all to settle into a quick pace. I noticed I wasn't the only astonished at my time at the mile markers and wondering if I should slow down. But the pace felt comfortable, and it didn't take long before some familiar scenery from the Helen Klein 50 appeared, including the nice flat dirt trails on either side of the bike path. Many of us ran on this section to save our legs for the latter section. I hit Watt Ave (5.9 miles) in 38:40, and William Pond (9.4 miles) in 1:12:03, so I was hovering around an 8 minute mile. As the runner's high kicked in, my mind and heart began to weave in and out with the bike path. I welcomed a chance to ponder many of the new emotions that have entered my life in the last few months, and long, flat ultras are good for that. Christi and I got a surprise x-mas card from the stork this season, saying a baby girl would be on the way in August (our first). We're incredibly excited, but clearly have no idea what we're doing. ;-) On top of that, an idea I had for using your cell phone to help find sales/deals near you quickly became NearbyNow, a new technology company with me at the helm. In case that wasn't enough stress, Christi and I got involved in a car accident on I-80 coming back from Way Too Cool, putting her car in the shop (and me in a rental car) for weeks. Yet in the rhythm of the run, all this emotion just fueled my fire and pushed me forward. As I hit the Nimbus Dam Overlook (19 miles) at 2:46, I wondered if perhaps I had a bit too much fuel in the fire. Should I slow down and save some energy for the hills at the end, or should I just push through? I asked my body, and it said "push". We climbed up off the bike path to the Nimbus aid station, and began running along dirt paths and an access road for the next 2 miles. My "street shoes" weren't sure what to make of the single track, but the trail was smooth enough that it didn't matter much. I had misread the AR50 description as "27 miles of pavement, followed by 23 miles of dirt". In truth, after Nimbus there is more trail than road. After a quick single track hike up to Nimbus, there is a mile of pavement, and then mostly dirt road and single track all the way to Beals Point. 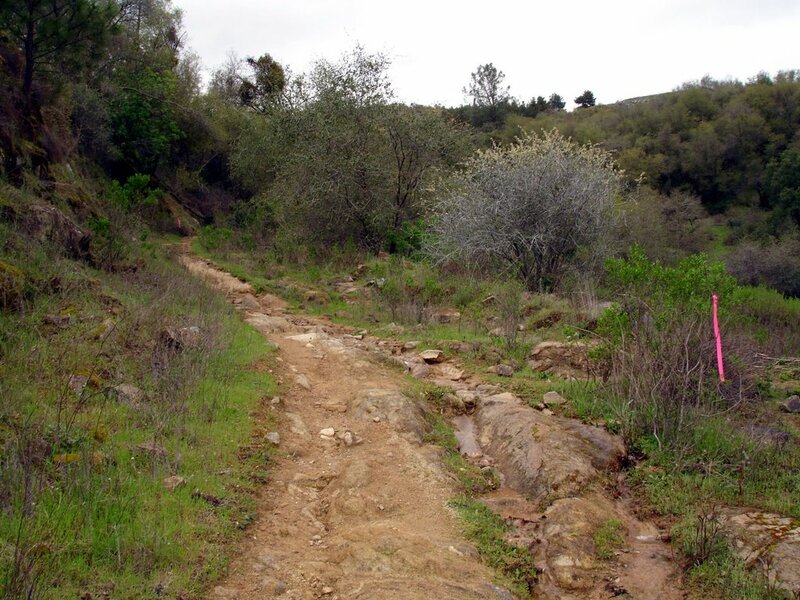 The trails were a welcome change, and a chance to see some of the wildflowers soaking up the rain and stomp through some gargantuan mud puddles. But it was very doable with street shoes. As we came down towards Beals Point (27.4), my stomach started to have second thoughts about that grand slam breakfast (next time, no bacon!). The discomfort slowed me down about 30 seconds per mile, but it wasn't unbearable. I kept urging myself to move forward, oscillating through mantras such as "never give up, never surrender" (yes, that's from Galaxy Quest!) and "there is no way back but forward". A new mantra showed up too - "make your daughter proud". She's not even born yet, and I'm already feeling her support! I had a seat at Beals Point to change my shoes and eat potatoes to try and calm my stomach. Luis Escobar powered through the aid station, and I picked up the pace to catch up with him. We made quick work of 1.5 miles of flat gravel road, and began 3 miles of rolling hills. Luis is a superb downhill runner, frolicking with gravity like an old childhood friend. I did my best to keep up with him by going a little faster on the flats. Together we chugged through to Granite Bay (31.5), passing 5-6 other runners on the way. 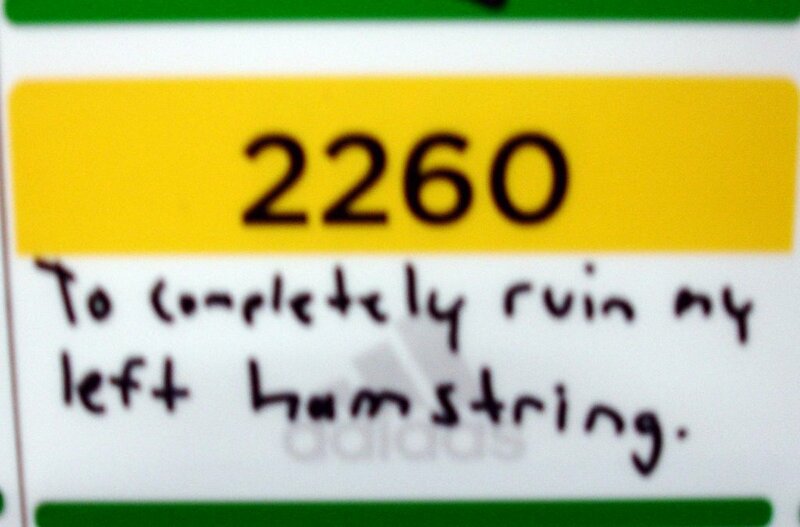 At Granite Bay, I figured out two things. First, I was definitely going too fast. My 50k split was 4:15 - a new PR. That's not a good sign in a 50-miler! Second, my stomach issues were not going away (perhaps they were connected?). I had been cautious to eat small PB&J squares, potatoes, and other "real food" so as not to get too hungry, but here I was with a hollow stomach again. I tried to take an extra few minutes at the aid station to let my stomach rest and take in some fluids. As I did, Rena Schulmann came charging through the aid station, definitely going faster than when she started. Go, Rena! As I passed Buzzards Cove (34 miles), the single track began to look like a "real" trail run, with rocks, creeks, zigs and zags. Some of the muddy areas were too big to get around (including one right before Rattlesnake Bar that was HUGE). I passed Jady Palko, whom I had recognized from the warming tent after Way Too Cool. He and his pacer were making great time, despite "feeling beat". We all refueled at Manhattan Bar (43.2 miles, the last food in the race), which gave Jady enough boost to kick into overdrive. At this point, I figured out that if I walked the uphills my stomach didn't act up too much. I knew the last climb was going to be a doozy. At mile 46.5, the big climb began. It started out on dirt, averaging about a 14 degree incline (I think), but had some flatter sections where running was possible. It didn't take long to reach Last Gasp (47.6 miles), and as I did, Dean Karnazes came cruising by, all smiles. We headed up the last road, which averaged about a 10 degree incline. You could see and hear the finish up on top of the Overlook. David Ruvalcaba, a 51-year-old from Madera, CA, set a great pace about 100 yards in front of me, and I chased his red jersey all the way to the finish line in 7:57, good for 36th place. The volunteers quickly dressed me in the AR50 jacket, put soup in my hand, and pointed me to the box of anti-poison oak wipes provided by Zombierunner.com (thanks guys!). I caught up with the finishers to find out that Uli Stedl had won in just under 6 hours, with Chris Zeiman just a few minutes behind him (Auburn Journal has a great article about their race). Eric Skaden, Graham Cooper, and John Ticer finished out the top five. Julie Udchachon won the women's division, with Rena Schumann closing in within 2 minutes for second place. Despite the mud, they had all put in great performances. 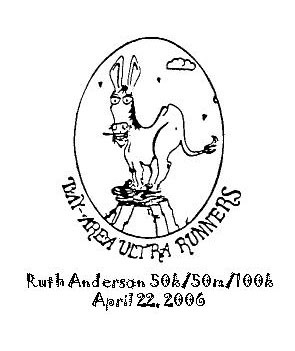 * 25% of Way Too Cool runners also ran the AR50. 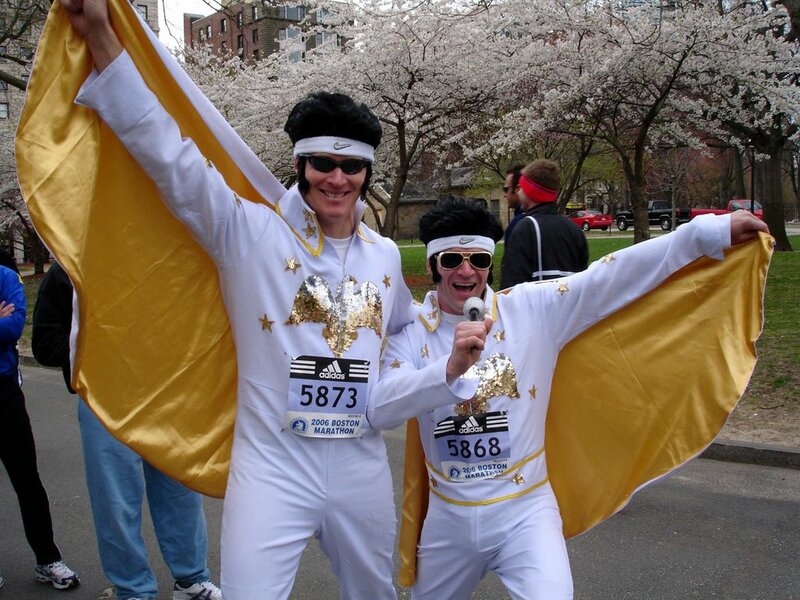 22% of AR50 runners ran Way Too Cool. * 51 ran AR at a slower pace than Way Too Cool (as one might expect), 8 ran the same pace, and 41 people actually ran AR50 faster! I had one last surprise waiting for me - I went to my car to find the back window smashed in and all my belongings stolen, including what was in the trunk. Doh! Luckily my rental car was the only one hit and I still had the keys. I guess I'm not having very good "car-ma" this year (ha, ha). Like a true runner, I was less worried about the laptop and money, and more concerned that I didn't have dry clothes. Kind of ironic that I just did a blog entry on the Hitch Safe...now only if they made one big enough for a change of clothes! In not-so-rare form, Greg Soderlund and the AR50 volunteers quickly took care of me. 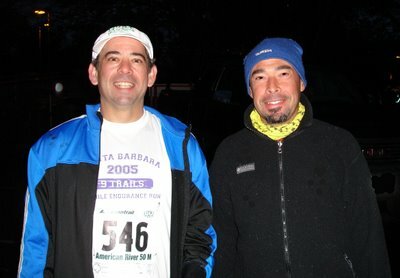 Before I could even snap out of my running daze, Greg had gathered up enough extra clothes to keep me warm, John Rhodes had patched up my window with cardboard, the police wrote up their report, and Jady, Luis, and other runners offered to take up a collection to get me enough cash to get home. It really meant a lot to me that this community of people I only know through running would rally to my support.